Haywood Waterways Association honored five “Water Champions” for their work to protect and improve Haywood County’s rivers, streams, and reservoirs in 2017. The awards were given at the organization’s annual Christmas holiday dinner. The Pigeon River Award is given to the individual or organization that has made a significant contribution to protecting Haywood County’s land and water resources. However, this year HWA broke tradition and gave the award to a project - the Dotson Branch Stream Corridor Restoration and Water Quality Improvement Project, a multi-partner, large-scale effort that is having tremendous impact on the county’s waterways. The project is locally managed by the US Department of Agriculture - Natural Resources Conservation Service and Haywood County Soil & Water Conservation District. From the mouth of the stream at the Pigeon River to the top of the watershed, Dotson Branch flows through primarily agricultural land. Water quality was extremely degraded by sediment and nutrient loading from livestock, and there was very little stream side vegetation to help filter pollutants. 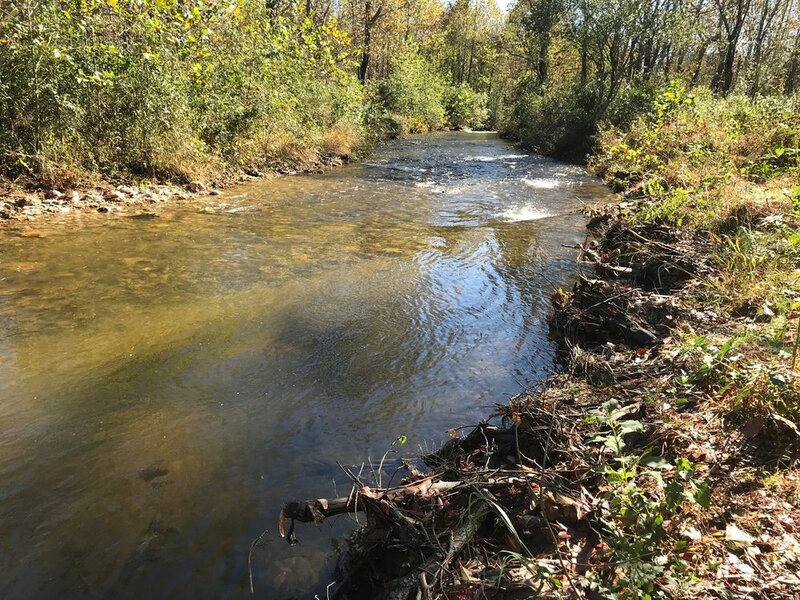 The solutions included restoring 10,000 linear feet of stream channel to proper hydraulic function, stabilizing 18,600 linear feet of eroding stream bank, planting 10.7 acres of stream side trees and shrubs, and fencing 3.5 miles of stream bank to exclude livestock access. John Ottinger, Supervisory Soil Conservationist with NRCS, said, “Thanks to the farmers who were willing to participate and improve water quality. To date, over $1 million has been secured and is being used for solutions that are improving water quality and protecting valuable farmland.” Other partners include the Southwestern NC Resources Conservation and Development, Resource Institute, and NC Division of Water Resources. The Big Creek Award for Partner of the Year was presented to Lynn Sprague from the Southwestern NC Resource Conservation & Development Council. Lynn was recognized as one of Haywood Waterways primary partners, helping to develop projects and manage grants. Most recently these projects include working to remove a dam and creating a Watershed Action Plan for Beaverdam Creek; starting the Fines Creek Watershed Restoration Project to remove it from the state list of impaired waterways; implementing stormwater collection and treatment practices in Maggie Valley to help protect Jonathans Creek; and starting stream restoration projects at East Street Park and Chestnut Park in Waynesville. He’s also a partner on the Regional Erosion and Sediment Control Initiative working to implement mountain-specific, cost-effective and on-going sediment and erosion control training for dirt movers called Mountain H20Pro, and serves on the Haywood Greenways Advisory Council helping to promote greenway development. Lynn is currently working with Haywood Waterways to develop a program to help homeowner’s associations control stormwater and stabilize roads to reduce erosion. Volunteers are an essential part of the Haywood Waterways community. They help promote the organizations work, collect water quality information, and help protect waterways through such activities as planting trees, picking up trash and stenciling storm drains. The Volunteer of the Year Award was renamed this year in memory of the late Richard T. Alexander, long-time member of Haywood Waterways and active volunteer throughout Haywood County. The Richard T. Alexander Award for Volunteer of the Year was given to three individuals, Bob Kimzey and the husband and wife team of Les and Julie Taylor. Bob was recognized for his service collecting water samples as part the Volunteer Water Information Network. He was responsible for the Plott and Allens creeks sites and faithfully sampled them once a month between 2008 and 2017 before retiring this year. The VWIN Program collects water chemistry information from 24 sites throughout Haywood County. Haywood Waterways uses the information to justify projects and leverage financial assistance. The second Volunteer of the Year winner was the husband and wife team of Julie and Les Taylor. They are new members of Haywood Waterways and are already having a big impact. They collect water samples for the VWIN program and have participated in multiple stream clean-ups. They also frequently help with other opportunities and even recruit new members to join the organization. Haywood Waterways also recognized Andrew Bowen for his service on the Board of Director from 2016 to 2017. Andrew was the Planning Director for Maggie Valley during that time. A $50 donation in his honor was given to the Pink Francis Scholarship Fund at Haywood Community College. Financial support for the membership dinner and awards was provided by Derric and Donna Brown, Pigeon River Fund of the Community Foundation of Western NC, Town of Clyde, and Town of Waynesville. MOUNT AIRY, N.C. – As development expands in even the smallest of North Carolina towns, erosion is a growing problem for existing waterways. That was the case for Mount Airy before city planners partnered with water conservation experts to find a solution that's paying back in big dividends. To prevent further erosion and clean up the Ararat River that passes through the town, more than six miles of greenway were built. Darren Lewis, Mount Airy’s assistant parks and recreation director, says in addition to fixing a problem, the Granite Greenway planted an economic seed. "We're really excited about what it has done for the private businesses that really see the value of the greenway,” he states. “It has created several businesses that have opened along the greenway." Several restaurants and outdoor recreation businesses have plans to open up along the river, and some have already opened their doors. In addition, the greenway has inspired at least 15 different races or charity walks that are helping local nonprofit groups and drawing tourists to the area. City Manager Barbara Jones says the benefits created from better managing the waterway will be experienced for generations. "It has turned into a great opportunity,” she states. “It has turned into a great economic driver for us. It has been definitely a positive boost for Mount Airy." Like many cities, Mount Airy felt the impact of the Great Recession and several large factories shut down. Community development organizer Martin Collins says because of the renewed interest in the downtown coming from the Granite Greenway, the city has been able to redevelop the large buildings into spaces for businesses and residents. "We're finding reuse of vacant buildings by business, and other adaptive reuses that will provide more customers for downtown businesses and restaurants," he explains. The Mount Airy greenway project came about as a result of a partnership with Resource Institute, a nonprofit organization that manages public funds and partners with local groups to better manage water resources. NEBO, N.C. – Cooler temperatures and changing leaves in North Carolina can make it easy to forget that there's still some wildlife depending on the plants in yards and gardens. You might say some pollinators - like hummingbirds and Monarch butterflies - are getting by on "a wing and a prayer" as they use North Carolina as a pitstop on their migration south to warmer temperatures for the winter. Park ranger Jamie Cameron, at Lake James State Park, says he looks for plants that bloom in the fall to ensure there's pollen available. "This time of year, I believe that your pollinator gardens serve as a critical pitstop for certain critters, and I specifically try to select for sources of pollen that will come late in the season," he says. He recommends Culver's root and asters as good, late-season pollinators to plant. He also trims some pollinating plants back earlier in the season, to delay their maturity and make their pollen available in early fall. Cameron adds that making sure streams and waterways have healthy vegetation serves a dual purpose - maintaining water quality, and providing pollen sources for birds and insects. Resource Institute is a nonprofit agency that pairs public dollars with local water-management needs. Alan Walker works for RI as a field consultant and says creating robust habitats for pollinators is also good for many other wildlife species. "It's important that they have critical habitat to feed on to make those things happen, and what Resource Institute does is incorporate those plantings and seed mixtures into the stream bank and shoreline stabilization projects, to create additional habitat for pollinators," he explains. Cameron says while creating pollinator gardens is important, it's equally important to remember why they're needed now, more than ever. "Pollinator gardens are great, but you know, we're just trying to recreate what is naturally available," Cameron adds. "The reason that we need pollinator gardens is because so much habitat has been lost, either through development or agriculture, or the use of herbicides in modern culture." In addition to planting gardens, he advises people to curb the use of herbicides and to use native plants in their gardens to support insects and birds that may be struggling to find food. Resource Institute's Chairman, Squeak Smith, accepts the NCWF Conservation Organization of the Year Award. WARSAW, N.C. – It's been a little over 10 months since Hurricane Matthew ravaged parts of North Carolina causing flooding in river basins across the state. Although the water has receded, the cleanup continues and the state is partnering with the nonprofit group Resource Institute to restore rivers, streams, wetlands and ponds impacted by the storm. Vernon Cox, director of the Division of Soil and Water Conservation with the North Carolina Department of Agriculture and Consumer Services, says the partnership has really pushed progress ahead. "Having someone like Resource Institute with that capacity to get people out in the field and do assessments and get on with the process of recovery is very important to us and for the agricultural community that we work with," he states. To date, the assessment work is completed on 13 dams and one section of stream. The next steps are cost estimating, design, permitting and construction. Resource Institute pools public resource dollars and connects them with communities that need them. State Rep. Jimmy Dixon of Warsaw says his district already is seeing a positive impact from the public and private sector working together. "From my point of view, the people in charge of requesting these funds and administering have done a very, very good job,” he states. “I have heard very, very few complaints on the timeliness of the work being done." Cox says oftentimes preventing the magnitude of flooding that happens during a storm like Hurricane Matthew starts way before weather pattern develops. "It's a huge issue in the eastern part of the state,” he points out. “If we don't stay on top of removing stream debris, then drainage becomes a significant issue, and when the next storm event occurs, it becomes that much worse." It's estimated Hurricane Matthew caused at least $4 billion in property damage. The General Assembly allocated $38 million to aid in repairs, in addition to what's available at the federal level. RESTON, Va. – This weekend, the National Wildlife Federation recognized long-time North Carolina conservationist Richard Mode with its National Conservation Leadership Award. The National Conservation Leadership Award recognizes exemplary conservation accomplishment or sustained conservation leadership. The award ceremony took place at the National Wildlife Federation’s annual meeting held at Skamania Lodge, in Stevenson, Washington. An unwavering commitment to the conservation of our natural resources is what has driven Richard Mode to spend the last three decades mobilizing other outdoor enthusiasts into a powerful force that has impacted local, state, and federal resource management decisions and legislation. As a board member of the North Carolina Wildlife Federation (NCWF), past president and board chair of Trout Unlimited (TU), and founder of the local TU chapter, he has dedicated his life to advocating for strong conservation policies, organizing networks, and growing and developing organizations. Richard has served for over two decades as the affiliate representative to the National Wildlife Federation (NWF) with a collaborative spirit and a positive attitude that leaves a lasting impact on others. Richard’s work on clean water, high-quality trout habitat, and vibrant forests has made a measurable impact on the wildlife resources of the Southeast. Through his years with NCWF, TU, and NWF, Richard has been heavily involved in fights to save rivers and overhaul hydropower management decisions so they account for wildlife and fishery resources, minimizing the impacts of timber and mining operations on fish and wildlife by federal and state agencies, defending public lands, and advocating for effective air and water quality legislation. He has spearheaded efforts to engage the agriculture and forestry communities on wildlife and habitat issues related to climate change, including longleaf pine restoration, biomass, early succession habitat management, and carbon sequestration. Richard’s chief goal has always been to bring hunters, anglers, and wildlife enthusiasts to the public policy arena to protect the special places and wildlife resources in America. He believes the passion, ethics, and knowledge that hunters, fishermen, and wildlife enthusiasts bring to the table is a necessary ingredient to making good policy decisions. Richard’s decades-long support of NCWF and NWF initiatives is unwavering. The only dedication that trumps this commitment is to his family. Richard is an immense inspiration to his children and grandchildren – his “grand girls” – and they no doubt have developed their love of the outdoors through him.